I wish I could go to one of your retreats, but weekends are hard because of Shabbat. One day I’ll work that out. Somehow. Somehow. Hi, I have the same problem about the Shabat. Perhaps we should start a Shabat Girls group! Coming I to a workshop on Sunday having missed the first day, or finishing a workshop one day early is not ideal. I have a better idea – Come a day early, or stay a day extra!! I’m in for a Shabbat retreat. I don’t spin tho. The nice thing about Strung Along Retreats is that each day of the traditional schedule (No spinning workshop) is a stand alone class. One day with each of the instructors. So you wouldn’t be coming into the middle of any one class. I’m not sure how the Inn would accommodate kosher meals, but they are brilliant and could figure-out something, I’m pretty sure. Further proof that Judith is Saint Judith — she knew you and that fleece were meant to be together! A little bit of joy is all we need sometimes. You have had a rough year, and I am so happy this little bit of Jacob has brought that joy. We get so wrapped up in what is wrong with our life, that we fail to see the little bits of joy. Enjoy your snow day. Here in Iowa, we are experiencing high winds, low temps and – 20+ wind chills. Spending the rest of the day in my quilt studio finding a little joy in my current project -a baby quilt for my new grandbaby due in August. Enjoy, Steph! Sure sounds like joy to me. Have at it, I say. 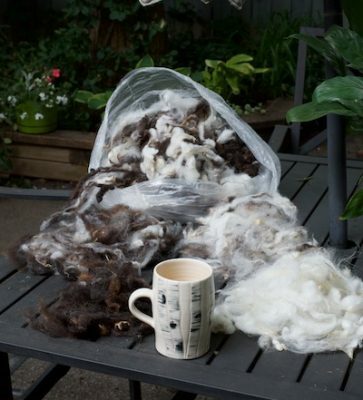 I have a jacob fleece that I bought at shearing day at Meredian Jacobs (near Davis, CA). I washed and sorted it while visiting my mom. Mom passed later that year and I haven’t had the heart to do anything with it, but you’ve inspired me to pull out that fleece, spin it up, and knit something in her honor. It’s totally covered, under Komono. Her book goes into more detail. I completed the process last January. I made separate categories for spindles, yarn, fiber, and wheels. Marie Kondo would appreciate just how much joy the Jacob fleece “sparked”! I don’t spin but I love the look of that wool just being wool. I can’t wait to see what is becomes. That fleece is gorgeous. Those are the kinds of colours I love. Can’t wait to see what it becomes! 🙂 Spin on, Stephanie! Oh, this story makes me happy. Happy spinning! It’s so wonderful when bits of joy kind of fall into our lives like that. The Jacob is beautiful, and I look forward to seeing what you make of it. As for Marie Konda, I tend not to watch shows where someone tries to tell me how I should live my life. You do you, and do what makes you happy. I would love to attend one of your retreats (or more), but it just hasn’t been in the budget. Someday, somehow, I will get there. Lovely. 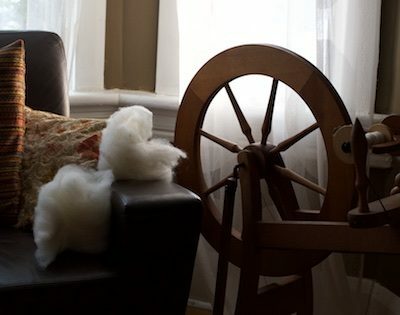 I have SO MUCH fleece to spin from the alpacas I used to own, and some sheep fleece I bought here and there….and your post reminded me I need to get on it. Since I became a weaver my spinning has been neglected. You are so right. I enjoy all my belongings and I have three fleeces in the dining room. I know what makes me happy. The charity shops here are groaning with the stuff people have thrown out as a result of Marie Kondo. Most will end up in landfill (and some is ending up in my place to be made into warm clothes for Syrian refugees). Stephanie, your reaction reminded me of how I felt when I opened a plastic bag in a charity shop a few weeks ago. It contained a tiny merino lamb fleece… it was filthy and covered in burrs. I tried to resist it for a millisecond but now I am half way through flicking out the burrs and washing it. It’s pure fairy down! Yup, I was waiting to see a link to the pattern she was going to use! Me too!! Maybe Stephanie can drop a hint a day until we all guess! Some kind of gradient type of thing to show off the various colors?? Me, me, me, pick me!! I’ll guess!! 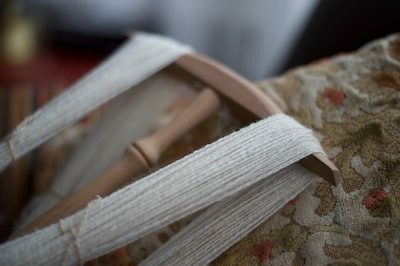 I think it will be an icelandic shawl, either hap or half-hap, like Thordis. Perhaps we start with technique: knitting or weaving or another??? I am wondering the very same thing!! Was looking for a pattern link and now I’m so curious! I hoped as soon as I saw you were playing with fleece that you were destined to have another Jacob. Can’t wait to see what you do with it. Am I the only one who sees the face while the fleece is in the bag? I see 2 eyes, an ear, a nose on a white snout, and a mouth. He’s beautiful. As soon as I read that I went back to look and there is a face!! Well spotted!! Oh how lovely a gesture and such a gorgeous little fleece. 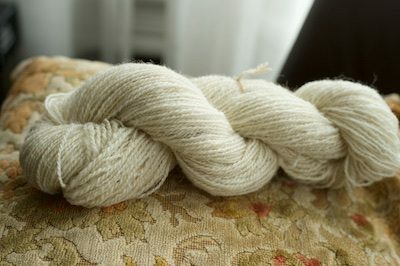 I just finished spinning about 4 ounces of Jacob for Shave ‘Em to Save ‘Em and it is such a delight to work with. Enjoy and can’t wait to see what it is to become. Bless Judith! Such a true friend!! Happy spinning and knitting! I can’t wait to see what is in store for this precious fleece! Soooo lovely. Wonderful Judith. We’ve been watching the Marie Kondo show as well—my favorite effect is my 5-year-old asking to make his room beautiful like on the show. I came away from Port Ludlow in November with A Plan. A few ounces of muga later, much joy has been sparked. Now to find the fiber to ply with it, and then to narrow down my pattern choices…. I REMEMBER that Jacob fleece. I am so glad it landed on the top of the Stash – to bring us all some joy (I’ve got a contact-high)…. Enjoy your snow day! Your timing is perfect: today I skeined up my first ever skein of Jacob! Rather than the colors being separated out like yours, it’s all mottled together into a lovely variegated gray. I have to admit that I don’t properly know who Marie Kondo is, but if she doesn’t allow for (carded) fleece in the dining room, then she’s just plain wrong. Can’t wait to see the Jacob’s destiny! Can I “LOVE” this comment?? Well, I do!! Hooray! 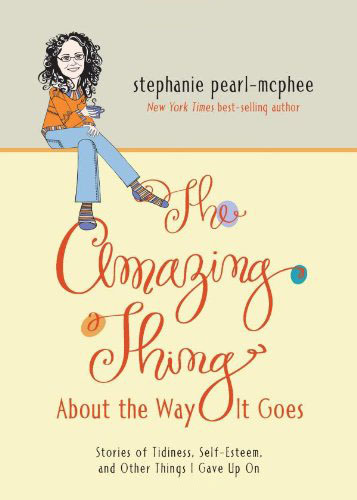 I remember how you gently tossed all sorts of figurative kisses over to that wee fleece on the table at Strung Along and it is just the sweetest thing ever that it now is becoming what it should be in your happy hands. 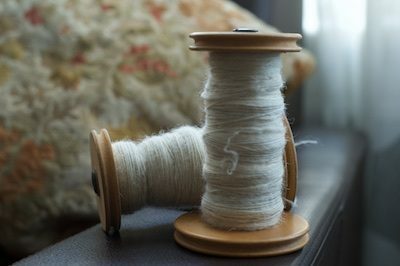 I can’t tell you how wonderful it is to open my computer and find this beautiful tale of carding and spinning and loving the wool. Just witnessing your care and joy is such a blessing as we try to survive such a busy, non-tactile, computer interfaced world. Thank you!! That Jacob is so magical it’s sparking joy here in the US! I think Marie would appreciate that you are using it and have a use for it. Clearly she would put that under treasures. Maybe store the batts upright together in a box for the full Kondo effect? Can’t wait to see what it becomes! Everything about this entry cheers me up and gives me hope! Jacob is dear to my heart, as well, and I rarely pass up the chance to buy their fleece. Every step of your prep process makes my heart sing! 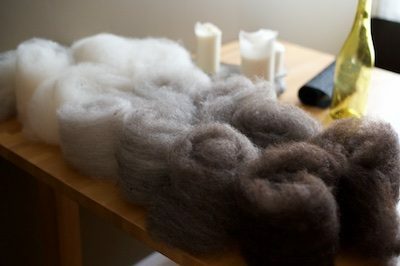 There’s nothing like an array of fluffy, carded, natural-colored batts to make me feel like anything is possible. I’m so glad this is in your hands. You really deserve it; you and the fleece will do each other good. A wonderful story. I read a bit about Jacobs on the link. They are good mothers, give birth easily, and you can make buttons from the horns! I see a whole project evolving here, which definitely includes sheep-horn buttons! Oh look! the computer did it for me! And I’m touching the paper clip to add this comment! I look forward to see what you will make with this lovely material. Also – thanks for the inspiration – I learned something today by looking up information about Jacob sheep … and it’s heartening to know that there are an increasing number of people raising heritage breeds of sheep, and breeds that are hardy and fit well with earth-respecting agriculture practices. Kind regards! It’s good to see you spinning again. It’s what the heart wants! So glad that you are spinning again! Thanks for the lesson on Jacob sheep – I am off to Google images! Judith is your fiber angel! What a great gift. And what fine spinning. Plied, and still only laceweight? I can’t wait to see what you do with it. Judith is truly one of a kind and a real sweetheart. She taught me to spin when we were both living in Montana and we’ve been really good friends ever since. My parents went to Maryland Sheep and Wool years ago and bought me a Jacob fleece. At the time, I’d never heard of them, and I loved the sheep rainbow of it. I can so relate to your reaction… Thank you, Judith! 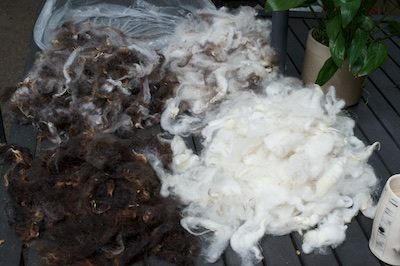 Its been a long time since we talked fleece. I’m looking forward to seeing what you knit. Oh, I love me a Jacob Fleece, too! Mmmmmm. Seeing that fleece was like seeing an old friend! Can’t wait to see its next step! My vacuum cleaner has never given me one bit of joy. Enjoy your Jacob. Everyone should be so lucky as to have a friend like Judith. Brilliant, talented, fun, and kind! She’s the greatest! I’ve been wondering about the spinning. Lovely fleece, I can see why you’re smitten. Now to see what you have in mind for it. Anticipation! Awww sweet sweet sweet! Can’t wait to see the end result! Love projects that grab our souls! It’s so cold today the mail service is cancelled. In Chicago they’re warning contact lenses will freeze to your cornea. So why do I have this lovely warm glow? You are Pure Inspiration! It’s -20 below here and I needed someone to remind me that the Spark of Joy that fiber (or fibre, to you) give is a real thing and very much OK! That business is charming! How lovely of Judith to share! Yes, clear out all the clutter and you have more room for yarn! Good plan, I like it. Ooooh, I may have to acquire a Jacob fleece in the near future. I love the sheep themselves. And not only are they eye-catching, how can you not like a sheep that is Biblically linked (not really…but it makes for a good story!) AND linked to manor houses (because it looked good out on the lawn before lawnmowers were a thing!)? Actually, when I used to fantasize about actually owning sheep, Jacob were among my top choices…because they are the right size (not big) and have lots of options. The fact that I would be a novice sheep owner working with animals with lots of horns kind of got glossed over. Some people have fantasy sports teams; I have a fantasy sheep flock! Yep. I have a couple fleeces that are going to be attended to now that a drum carder has entered my life. I know just how you feel. What a lovely little fleece, you will have so much fun with that and the end result will be beautiful. For a wonderful blog where you can see and read about Jacob sheep (and lots of other wonderful sheep too) look for “The crazy sheep lady” or Equinox Farm. You won’t be sorry – and you might find more joy if Sara has a Jacob fleece for sale! Karmic balance. Judith had an annus horribillis not so long ago. It would appear that she’s passed along a bit of the positive. Nice! Your series of posts from a few (?) years ago where you took us through the steps from fleece to finished shawl fascinated me. Looking forward to seeing what this beautiful bunch of fiber becomes! I too love Jacob, and while this isn’t from judith, I did pick it up at one of her retreats. 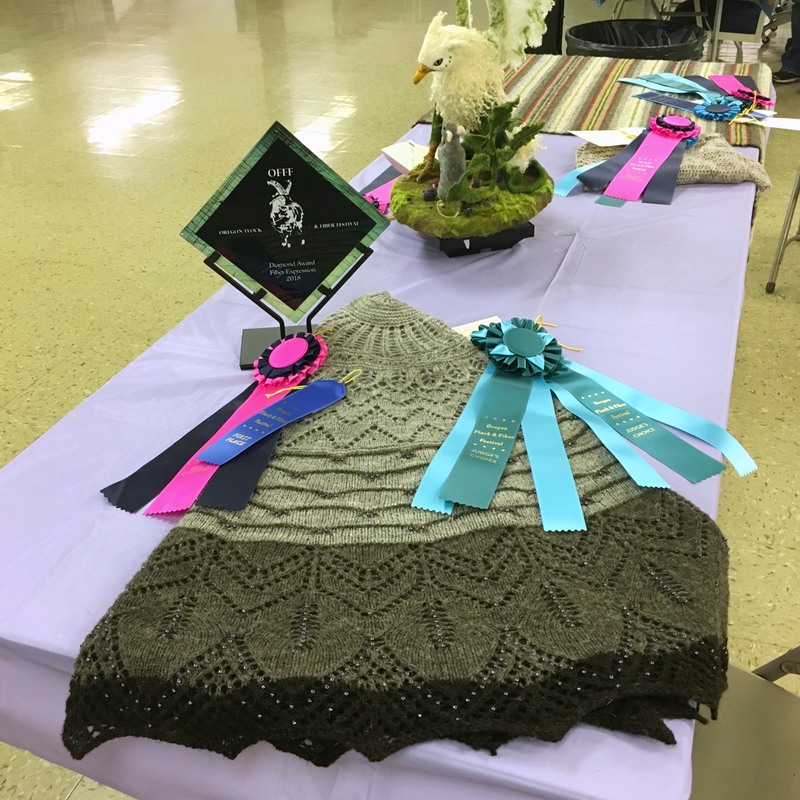 For the first time since 4-H, I entered something in a fair. I did okay, no? This is my friend’s blog. Judith is truly an angel, and you are an enabler of the finest skill. 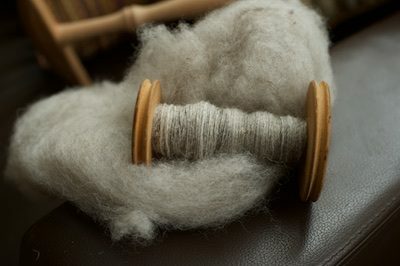 Reading your palpable JOY at that fleece and the satisfaction of those wee batts has reminded me of just HOW MUCH I used to enjoy spinning, and now I’m making arrangements to meet a man in a train station and take a spare wheel of unknown provenance off his hands. It is all your glorious fault for being so blimmin HAPPY! What a wonderful gift! I too love the Jacobs. I always look for them at Oregon Flock and Fiber. Yummy stuff! Judith is so delightful and generous!